Angels and Peach Flowers Cellophane Roll 24 inches wide x 50 ft long. Cello background is clear. Perfect for all types of occasions. size	: 24 in. 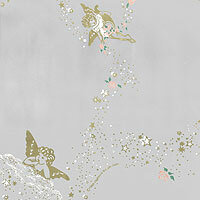 x 50 ft.
Golden Cupid and Angels float among white clouds and gold star showers with an occasional peach flower with pale green leaves. This design is pretty for Valentine's Day.